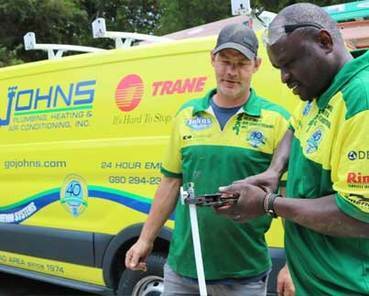 Johns Plumbing, Heating and Air Conditioning, Inc., has been servicing the Triad area for over 40 years. Greg Johns started the company back in 1974 with only one thing in mind—quality plumbing, heating, and air conditioning combined with superior customer service. Today we continue to provide outstanding service. With over 100 years of combined experience, quality products, and affordable flat-rate pricing, we have proudly extended our services to the homes and businesses of over 250,000 satisfied customers. We recognize that not all of our customers' needs are the same, and in response to the diversity of problems that may arise, we staff specially trained technicians who are capable of handling a variety of services. We structure ourselves into divisions, where each division has specially trained technicians to make certain that every problem we face has a solution. Forms of payment accepted: Visa, MC, Amex, Discover, Checks, Cash. 24/7 Emergency Service, answering phones live. Official Trane Dealer for Greensboro, NC. Members of QSC (Quality Service Contractors of America), PHCC (Plumbing Heating Cooling Contractors of America), and the Greensboro Chamber of Commerce. "I wanted to compliment your service representative, Paul Flynn. On March 25, 20151, Mr. Flynn made a service call to our home. He was professional, knowledgeable and thorough. He and his associate, Jay Wolfe, did an excellent job in solving our problem and we were very pleased. Mr. Flynn suggested that we get a new toilet and replace the leaking faucets in the master bathroom and gave us recommendations on what products would best fit our needs. We accepted his recommendations and appreciated very much his professional assistance. Mr. Flynn returned on March 31, 2015 with his associate, Travis Shepherd, to install the new toilet and faucet. We are very pleased with your company adn the service the Mr. Flynn and his associates provided us. Mr. Flynn is a great ambassador for Johns Plumbing and you can be proud of the manner in which he and his associates represent your company."